Exploring the Hudson Valley by bicycle, with its slower pace and sensations of sound and touch, you become aware of things you’ve never noticed before, though you might have passed them a million times. For a generation of free range parents who might have grown up on their bicycles, it’s easy to take for granted how our quickened lifestyle removes that opportunity from kids today. Luckily, two summer bicycle programs hosted by the YMCA of Kingston and Ulster County can change all that. In fact, after bicycling to a wetland less than two miles from his house in Midtown Kingston, one of the kids from last year's program told Bike It! Youth Cycling Program director Tom Polk that he never knew Kingston was so green. That was in the Bike It! 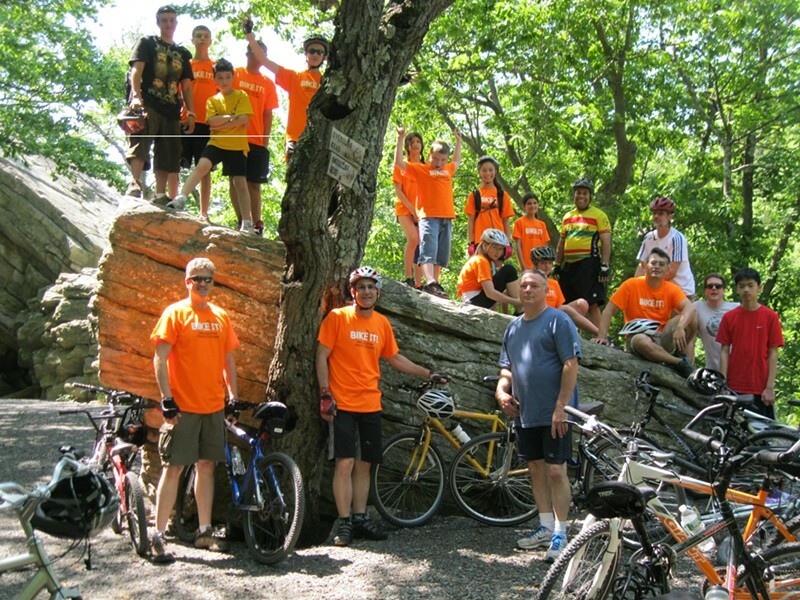 road and rail trail program, which meets at the YMCA every day except one, when they’re off to Minnewaska State Park in New Paltz. The camp, just for teens ages 12-15, runs from 9am - 4pm. There’s a skills lesson in the morning featuring bicycle and safety skills like safety checks, tire changes, flat fixes, emergency stops, and executing an avoidance weave. The afternoon is spent exploring trails and parks and just enjoying the Hudson Valley by bicycle. Each day ends with a swim. Bike It! road and rail trail program through the YMCA’s Youth Cycling Program at 507 Broadway in Kingston: August 8th-12th, 9a-4p, boys and girls ages 12-15, $225, scholarships and bicycles and helmets available. Campers receive a t-shirt with the Bike It! logo, a water bottle, bike multi-tool and snacks each day. Bring a small backpack, a lunch to carry, sturdy shoes, sunscreen, insect repellant, swim suit, and small towel. Parents are welcome to ride along anytime! Bikes can be stored at the Y during the program. For more info or to register, contact Tom Polk at 845-338-3810 x.102 or tpolk@ymcaulster.org. Mountain Bike It! through the YMCA’s Youth Cycling Program at 432 Peck Road in Shokan: two sessions held July 11th-15th and August 15th-18th, 9a-4p, boys and girls ages 12-15, $325 per week, scholarships and bicycles and helmets available. Transportation by Y bus from Kingston available, and travel to trail heads is done by Y van from Seewackamano. Campers receive a t-shirt with the Mountain Bike It! logo, a water bottle, bike multi-tool, and snacks each day. Bring a small backpack, a lunch to carry, sturdy shoes, sunscreen, insect repellant, swim suit and small towel. Learn more and register online. This fall, don’t miss the YMCA Youth Cycling Program's Saturday morning and afterschool classes, and the community ride on Saturday, October 8th, at the O+ Recovery Ride. Not near Kingston? Ask if your Y has a cycling program!